There are a lot of single board computers out there, but what sets the NUC apart (aside from the fact that Intel makes it) is the amount of computing power available using a very small amount of power. The model we tested (model: D54250WYK) features an Intel i5 processor that sipped only ~19 watts of power running at 75% processor load in our lab. This unit gave us a Novabench score of 567, which is just a bit lower than the score we see for standard i5 desktop computers. This should be plenty of power for the typical industrial HMI, SCADA, or signage application. Emphase mSATA G5 – Enterprise Grade MLC Solid State Hard Drive – chosen for high shock/vibe handling and wide operating temperatures. Transcend SO-DIMM DDR3L Low Voltage 1600 Memory – chosen for low power consumption and high heat handling. Since industrial applications generally require a fully sealed enclosure, selection of components is a concern. While the NUC itself is only rated to 50°C, we chose components which would be well outside that limitation. The NUC itself is a small, compact device measuring 117mm x 112mm x 50mm. With its included VESA mounting plate it can easily be mounted to the rear of a Hope Industrial Panel Mount Display using our VESA mounting bracket. Most customers would probably be mounting the NUC in our Industrial Small PC / Thin Client Enclosure which provides convenient VESA mounting points, as well as full cable management. 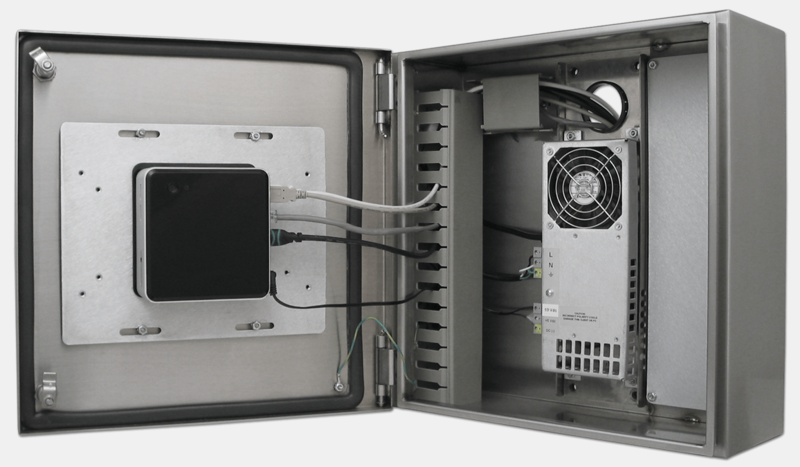 This enclosure also includes an high quality industrial DC power supply which is available with a 19 VDC output, required by the NUC. This lets you discard the power supply that Intel provides with the NUC. 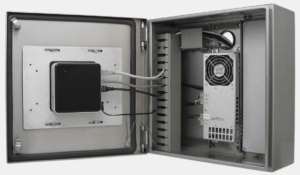 This enclosure is fully sealed and NEMA 4/4X (IP65/66) rated for wash down environments and provides a true “just add PC” industrial workstation solution. Taking a look inside the NUC it is worth noting that the unit has a small circulating fan located above the CPU. Fans can be problematic in industrial environments if they are not properly selected and are not high quality. 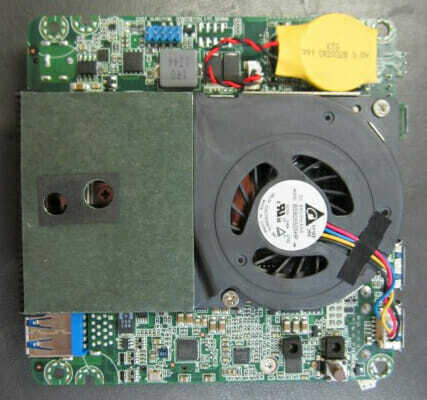 According to user feedback, Intel had problems with the fans in some earlier NUC models which seem to have been addressed, but given the size of the fan and its location, users in dusty environments might consider one of the available fanless NUC cases on the market, or at least one with a high quality long life fan designed for this type of environment. Heat sensors are placed on critical heat-sensitive components inside the PC (processor, memory, etc.). The PC is then run at a high utilization rate and the internal operating temperature rise is measured. The maximum internal operating temperatures for the components are determined by adding the temperature rise to the manufacturer’s maximum external operating temperature. The PC is then installed into our enclosure and the same internal operating temperatures are measured. The increase caused by being in the enclosure is then subtracted from the manufacturer’s maximum external operating temperature. Many different variables in the user’s environment can affect performance, but this tests gives us a good baseline for comparing thermal performance of a variety of different machines. Based on this testing, the Intel NUC (which is rated for temperatures up to 50°C) can be used inside our Small PC / Thin Client Enclosure at ambient temperatures up to 40°C (104°F). The Intel NUC is a useful PC thanks to its small size, relatively high power, and acceptable heat handling. Some consideration should be given to the quality and location of its internal cooling fan, but its low cost (~$500 fully configured) could make it a viable option for some industrial applications.